Need a hand with your lock or safe? Ensuring a licensed, bonded and experienced locksmith attends to your safe or vault is essential for fixing a non-functioning unit and allows for your precious possessions to be protected by an expert locksmith with experience and a deep understanding of your safe. Locksmith Monkey helps to keep your possessions safe. Whether you need a safe combination changed, a replacement safe key, a safe or vault opened or maintenance on your safe or vault, our expert locksmiths are available across Portland to assist with your exact needs. 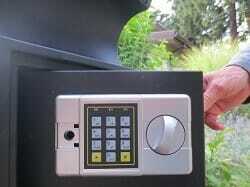 We can even install and maintain gun safes as required to keep your family protected. When it comes to opening, installing or repairing safes or vaults in Portland, Locksmith Monkey are the experts. Our qualified technicians can assist with a wide range of safes including combination locks, key locks, time locks and electronic locking. Our competent team arrives at every service call related to the safe cracking or lock replacement. Locksmith Monkey service is available in Battle Ground, Oak Grove, Troutdale, Tigard, Hillsboro, Oregon City, Happy Valley, Sherwood, Wilsonville, West Linn, Camas, Washougal, Lake Oswego, Clackamas, Tualatin, Fairview, Vancouver, Milwaukie, King City, Aloha, Beaverton, Gresham. Locksmith Monkey Portland specialize in repairs, installations and maintenance of room-sized fireproof vaults used for commercial clients and government agencies which can be rated up to Class 125-4 Hour for large data storage applications. Our team can manage all components of the safe including door assembly, cable penetrations, coolant line penetrations and air duct penetrations. If you’re looking to install a fire-resistant safe, the team from Locksmith Monkey can install a safe that is designed to protect contents from high temperatures and fires. Perfect for the protection of documents, data and possessions, fire-resistant safes are a fantastic option for a wide range of uses and can be installed in residential or commercial properties. If you’re searching for quality locksmith services in Portland at competitive prices, speak with the team from Locksmith Monkey. Our highly trained, friendly and professional locksmiths are available 24/7 and are fully licensed, bonded and insured.